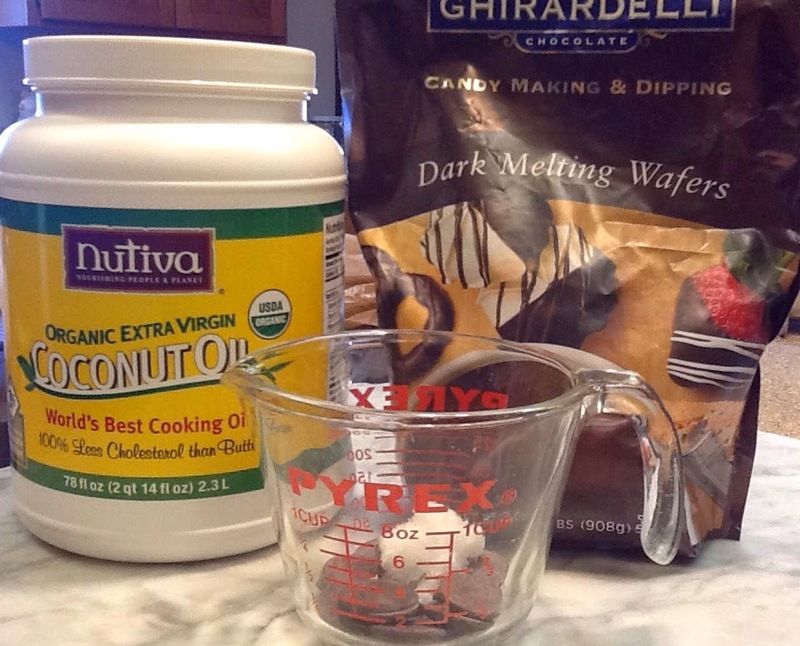 Usually I whip up a homemade chocolate sauce or syrup, that is until I was in a big hurry! Suddenly . . . I had an epiphany . . . I use coconut oil in so many of our homemade grooming products and in baking . . . Homemade lotions, body butters, eye cream, soaps, remineralizing toothpaste, my deodorant/antiperspirant, Will's shaving soap, in my bread baking and cookie making. 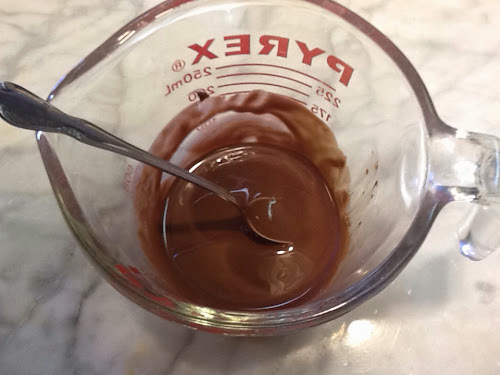 I thought, "What would happen if I added a bit of my beloved coconut oil to my melting chocolate? Would it make the fun chocolate shell we used to buy at the grocery store? I am delighted to report . . . My idea worked! 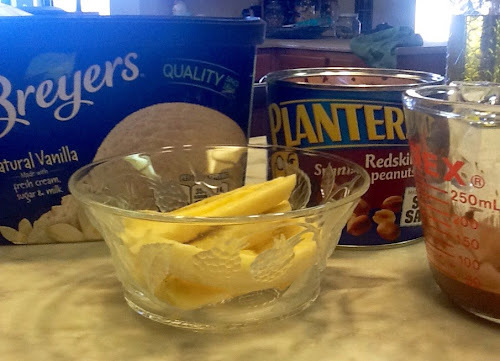 This 2 ingredient recipe is a quick, and easy way, to make chocolate shell, in seconds . . . And, it's healthy for you! Yes, you heard me right, besides tasting great, Extra Virgin Coconut Oil has so many health benefits! So, here's to making fun ice cream bars with chocolate shells, and ice cream cones dipped in homemade chocolate shell, and our new favorite . . . Banana splits with a drizzle of chocolate shell! 18 chocolate dipping disks, or 1 1/2 ounces of semi-sweet chocolate chips. Microwave for 30 seconds; stir. Microwave for 20 seconds; stir until completely melted. Spoon or pour over ice cream. Note: If you prefer to not use a microwave, a double boiler would work just as well. Julie's tip: I use an infant spoon for stirring because it has a smaller footprint. In less than a minute you have amazing, melted Easy-Peazy Chocolate Shell! Prepare your ice cream . . . We started off with sliced bananas, salted nuts, drizzle on the melted chocolate shell . . . Bam! It hardens . 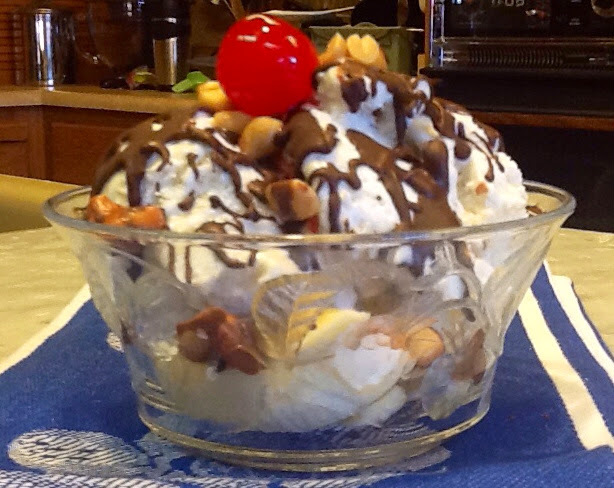 . . Top with a cherry, and you're ready to enjoy this decadent ice cream treat! I don't know why I didn't think of this years ago! I love the crunch of the rich dark chocolate, and it really makes eating ice cream a very special event . . . Over at Julie's!! !